Researchers TU/e together with researchers at the Hong Kong Polytechnic University (PolyU), have developed a special treatment for cotton fabric that allows the cotton to absorb exceptional amounts of water from misty air: 340 % of its own weight. What makes this 'coated cotton' so interesting is that the cotton releases the collected water by itself, as it gets warmer. This property makes of the coated cotton materials a potential solution to provide water to the desert regions, for example for agricultural purposes. The results of this research will be published next month in the scientific journal Advanced Materials. The researchers applied a coating of PNIPAAm, a polymer, to the cotton fabric. At lower temperatures, this cotton has a sponge-like structure at microscopic level. Up to a temperature of 34°C it is highly hydrophilic, in other words it absorbs water strongly. Through this property the cotton can absorb 340 % of its own weight of water from misty air – compared with only 18% without the PNIPAAm coating. In contrast, once the temperature raises the material becomes hydrophobic or water-repellant, and above 34°C the structure of the PNIPAAm-coated cotton is completely closed. When these high temperatures are reached the cotton has released all the absorbed water, which is totally pure. The research shows that this cycle can be repeated many times. Beetles in desert areas can collect and drink water from fogs, by capturing water droplets on their bodies, which roll into their mouths. Similarly, some spiders capture humidity on their silk network. This was the inspiration for this new coated-cotton material, which collects and releases water from misty environments simply as the temperature changes throughout the day. This property implies that the material may potentially be suitable for providing water in deserts or mountain regions, where the air is often misty at night. According to TU/e researcher dr. Catarina Esteves a further advantage is that the basic material – cotton fabric – is cheap and can be easily and locally produced. The polymer coating increases the cost slightly, but with the current conditions the amount required is only about 12%. In addition, the polymer used is not particularly costly. Fine-mesh ‘fog harvesting nets’ are already being used in some mountains and dry coastal areas, but these use a different principle: they collect water from misty air, by droplets that gradually form on the nets and fall to the ground or a suitable recipient. But this system depends on a strong air flow, wind. The coated cotton developed the research team can also work without wind. In addition, cotton fibers coated with this polymer can be laid directly where the water is needed, for example on cultivated soil. The researchers are also considering completely different applications such as camping tents that collect water at night, or sportswear that keeps perspiring athletes dry. The research was led by professor John Xin at PolyU and dr. Catarina Esteves at TU/e. 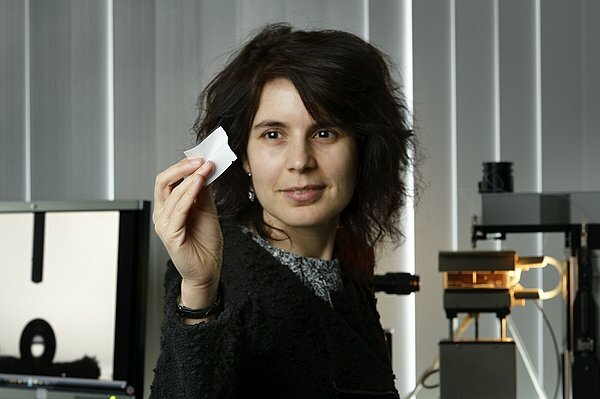 They now intend to investigate further how they can optimize the quality of the new material. For example they hope to increase the amount of water absorbed by the coated-cotton. Moreover they also expect to be able to adjust the temperature at which the material changes from water-collecting to the water-releasing state, towards lower temperatures.